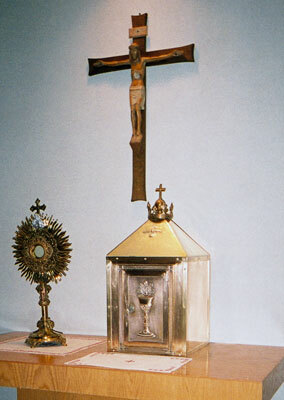 The Holy Eucharist is placed in an ornamental vessel called a monstrance (see the figure) and left on the altar for public adoration and worship. Catholics consider it a great privilege and blessing to be able to adore the Blessed Sacrament; some spend a holy hour in front of the Eucharist each week so they can privately and publicly pray and express their faith. Holy hour is the perfect chance to say prayers, such as the Rosary or the Divine Mercy Chaplet, silently in the company of Jesus. The Blessed Sacrament exposed in the monstrance on the left and within the tabernacle on the right. Courtesy of St. Louis de Montfort Church, Fishers, Indiana. Some parishes offer adoration 24/7, which is called Perpetual Adoration. Some other churches offer 40-hour devotion. The 40 hours in the term 40-hour devotion refer to the number of hours that the faithful believe Jesus was absent from the world. The period of time from his death on Good Friday at around 3 p.m. to his Resurrection on Easter morning at about 7 a.m. is 40 hours. These traditional three days — from Sunday afternoon to Tuesday evening — are when many Catholic parishes display the Blessed Sacrament in a gold monstrance on the altar. Displaying the Holy Eucharist is meant to promote adoration and worship of Jesus in his hidden but Real Presence in the Blessed Sacrament. The 40-hour devotion usually begins after the last Mass on Sunday. Usually, a consecrated host from that Mass is placed in the monstrance and put in the center of the altar after the faithful have received Holy Communion. The priest says the final prayer, but no final blessing is given and no closing hymn is sung. The priest, deacon, and altar servers kneel down before the Blessed Sacrament, and incense is burned (as Psalm 141 says, “Let my prayer be counted as incense before thee”). Six candles, three on each side, are traditionally placed to the left and right of the monstrance. Parishioners come and go throughout the day to spend anywhere from 30 minutes to an hour or more, just praying before the Blessed Sacrament on the altar. This amount of time represents the request that Jesus made during his agony in the Garden of Olives: Before His Crucifixion and death on Good Friday, he asked, “Could you not watch with me one hour?” (Mark 26:40). The goal is to have the church open all night and all day for 40 continuous hours to represent the time that Jesus spent in the grave. But this goal can be met only if safety and security needs are met to protect the church and any faithful making a visit (the same goes for Perpetual Adoration). Parishioners sign up to commit themselves for an hour or half-hour around the clock, never leaving Jesus unattended. Getting that many people to make such a commitment is easier in a large parish of a thousand families than in a small parish of, say, only 200 families. Some pastors ask different Catholic organizations within the parish, such as the Knights of Columbus, the Council of Catholic Women, the St. Vincent de Paul Society, and the Parish Council, to commit their members for time slots. And some have asked ushers, extraordinary ministers (laypersons who assist the priest with Holy Communion at Mass), altar servers, and so on, to take turns. Today, many parishes are forced to repose the Blessed Sacrament (put the Holy Eucharist back into the tabernacle) each evening of the 40-hour devotion after a prayer service — usually a combination of Vespers (evening prayer that includes the Psalms and other Scripture readings) and a sermon from a visiting priest or deacon. Then the Blessed Sacrament is exposed again after morning Mass on the next day. It doesn’t add up to 40 hours, but the traditional three days are still a part of the process. On the final evening, after the prayers and sermon, the pastor, priests, deacons, religious sisters, and first communicants engage in a procession before the Blessed Sacrament around the church. They march in front of the monstrance in the Roman tradition of having the most important person at the end of the line — in this case, Jesus Himself. The act of processing reminds the faithful of the joyful procession of Jesus into Jerusalem on Palm Sunday, the Sunday before Easter. It also symbolizes the return entrance of the same Son of God at the end of time when the Second Coming of Christ will take place. Finally, the pomp and pageantry of processing with the singing of hymns, the burning of incense, and the solemnity of the moment also reaffirm the belief that this is no mere wafer of bread being paraded around. Rather, it is believed to be the actual and real body and blood, soul and divinity of Christ. When the Blessed Sacrament passes the faithful kneeling in the pews, they bless themselves with the sign of the cross. They kneel in adoration of their Lord and God present in the monstrance. Following the elaborate procession outside around the church or inside around the four inner walls and through the aisles of the church, the priest or deacon places the Blessed Sacrament in the monstrance back on the altar and incenses it again. Benediction then follows.